My first time seeing garlic scapes was at the St. Jacob’s farmer's market earlier that day. Imagine my delight when they were on Berlin’s menu later that evening. Using as many fresh and local ingredients as possible is what Berlin is all about. The menu changes daily and despite the German sounding name, their dishes draw inspiration from around the world so you’ll experience flavours and ingredients from various cultures. Going back to the garlic scapes, after coal roasting the tendrils ($9) they’re chopped and topped on smooth ricotta cheese. The ingredient is like an amalgamation of green beans and asparagus, in terms of texture, with a sweetness augmented with a garlic essence that’s surprisingly light. 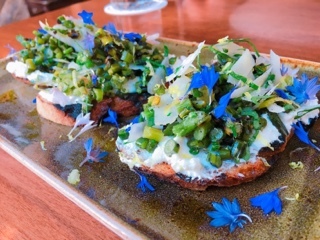 Of course, it could have been somewhat neutralized by the strong pecorino cheese and dash of lemon juice, combining to create a flavourful crostini. The grass-fed beef tartare ($14) were cut rather largely so I had to get over the fleshy chewy texture. Nonetheless, the diced smoked beets mixed with the beef were a good compliment, adding contrast to an otherwise soft mixture (even better once piled onto a thin crispy taro root chip). 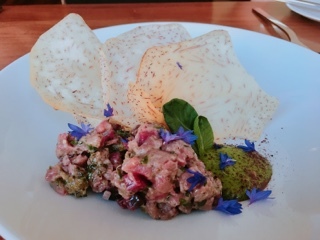 The beef itself could benefit from more flavour, as the toasted nori and sauce verte were lighter flavours; this dish is best suited for someone who likes a mildly flavoured tartare. Berlin’s menu has two starter sections: “to start” and “appetizers”. Surprisingly, the first two dishes ordered from the “to start” section are actually larger and heavier than the following appetizers. Perhaps it’s best to think of the “to start” selection a shared plates, great options for light bites. Our waiter explains that the chopped marinated tuna belly ($16) is actually pieces of fish sliced off in large chunks so there’s a pulled texture to the fish. 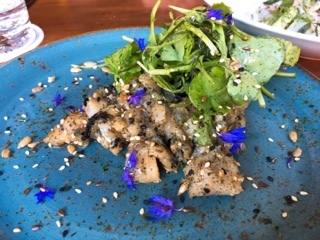 With plenty of meaty pieces tossed in sweet soy with nori, there's an Asian essence to the dish along with toasted seeds and wild arugula. 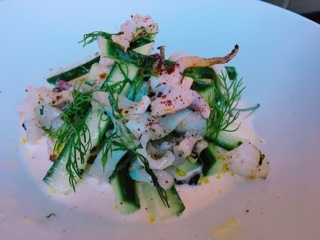 The grilled squid and cucumber salad ($15) was fantastic with the squid just cooked through resulting in a tender and sweet dish. 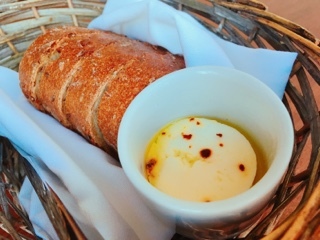 Crunchy cucumber slices tossed with olive oil, dill, and a hint of cream dressing makes it light and refreshing – great for the summer and the sauce perfect for dipping bread into. 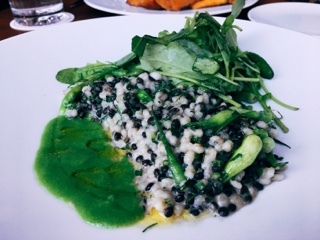 For risotto, Berlin’s pearl barley and lentil version ($26) was refreshing: the grains more nutty than sticky and the sauce, while cheesy, is lightened with tons of vegetables. At least half of the plate consisted of radish pods, which although looks like dried pea pods have an interesting radish essence. They take some getting used to ascertain pods were dry while others crisp and sweet – each bite is a hit or miss. Overall, for risotto, there’s a surprising amount of greenery built into the dish, giving it a light and bright finish. In fact, even the fish and chips ($24), a special they offer every Tuesday, had a generous handful of mixed summer greens. By the end of the meal, I was rather pleased with myself... I thought we made indulgent choices but actually consumed a lot of vegetables! 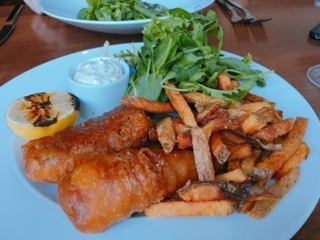 The Lake Erie white bass was a great for fish and chips since its dense and meaty, holding up against the crispy batter so there’s still fish flavours. The celeriac remoulade sauce was thick and filled with herbs, great for the fish or dipping the hot crispy fries into. For a restaurant that has so many sharable plates, the staff needs to pay more attention to what customers are telling them - despite informing our waiter while ordering and as each course was presented that we’d be sharing, we still had to follow-up to get side plates after they were cleared between courses. Regardless, it’s a small slip and in other aspects our waiter was attentive and friendly. We could certainly sense his passion for the city and the redevelopment going through the Kitchener downtown core, where Berlin is located, thanks to Waterloo’s expansion. Although I haven’t visited a lot of restaurants in the KW region, Berlin has certainly topped the list as my favourite; brunch or dinner, the food continues to impress, perfect for feeding the technology boom.